Agit-prop art legend, Royal College of Art lecturer and maverick Dr Who lookalike, Peter Kennard, is aboard the Black Rat Press prints bus. Destination: Further. Here he will be joined by his collaborator, Cat Picton Phillips. 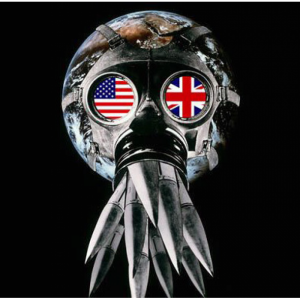 Peter Kennard is an artist with history. Creating politically charged and visually arresting images since the Sixties, Peter’s work hangs not just in the Tate and Victoria and Albert galleries, but also in the Imperial War Museum and Science Museum. Peter was also the influence behind Banksy’s Crude Oils show. His famous Cruise Missiles at the Haywain image, which reworks Constables rural masterpiece was done back in 1982 and was the original ‘crude oil’. Peter Kennard (born 17 February 1949) is a London based photomontage artist and senior tutor in photography at the Royal College of Art. Seeking to reflect his involvement in the anti-Vietnam War movement, he turned from painting to photo montage to better address his political views. He is best known for the images he created for the Campaign for Nuclear Disarmament (CND) and has his work displayed as part of Tate Britain’s permanent collection. Peter Kennard has spent most of his life in London, and has been considerably more involved than most in the capital’s political gatherings during the last 25 years. As a young artist he was a painter, much influenced by the “intense and merciless” etchings of Goya. Dissatisfied with painting’s lack of immediacy, he took up photomontage for its ability to show the “unrevealed truth” behind the image. His two major subjects quickly emerged: armaments and poverty. This was the early eighties with 3 million unemployed, Thatcher in her first term girding her loins for the Falklands War, and the CND at the height of its popularity. Kennard had an audience. For the next few years his images were everywhere. A series of touring exhibitions took his work into the galleries, but it was on the streets of Britain and Europe where they had maximum impact. “The point of my work is to use easily accessible iconic images, but to render them unacceptable. To break down the image of the all-powerful missile….after breaking them, to show new possibilities emerging in the cracks and splintered fragments of the old reality.” His belief at this time was that photomontage had the power to show the causes rather than the results. In recent times however, he seems to have had his doubts: “There is a problem with montage in that you see it everywhere now because of digital technology. There is so much transformed imagery around that people accept constructed images without questioning their meaning. I think my work was losing impact because of that.” As a result Kennard has devoted himself more to his teaching (he is now Senior Lecturer in Photography at the Royal Art School where he was a student) and to returning to his first love, painting. But he has not by any means given up his political activism: he regularly turns up at the London Stock Exchange with a barrow full of images and sets up an impromptu exhibition in the street, much to the consternation of passing stockbrokers.